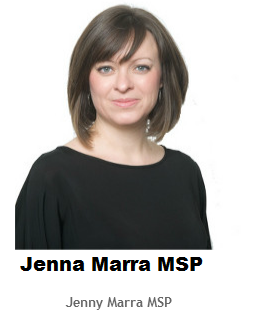 Figures released this week by the Office for National Statistics show an alarming rise in unemployment across Dundee as measured by the number and percentage of claimants of Job Seekers' Allowance area by area. In Lochee West the percentage rate is 11.5%, in Stobswell 11.2% and Douglas 9.3%. 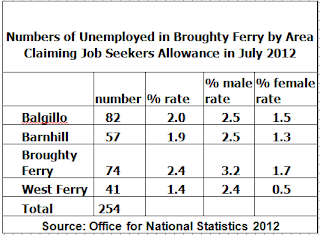 The table on the left shows that number of unemployed people and percentage rates of unemployment in The Ferry are proportionately lower than neighbouring areas in the City I have referred to. Nevertheless, it is a shock to see 254 of our fellow citizens in Broughty Ferry are unemployed and claimed Job Seekers' Allowance. Unfortunately these figures understate the level of unemployment and the jobs gap by not counting all those who are seeking work but are not entitled to claim Job Seekers' Allowance or those seeking longer working hours. 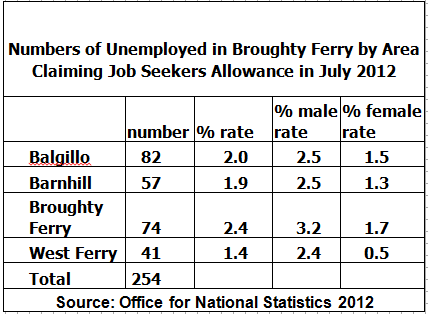 Of course for the person who is unemployed in Broughty Ferry, it is little consolation to know that the unemployment rate here is lower than other parts of Dundee because, for each individual unemployed and seeking work, unemployment is 100%. Clearly we need a comprehensive response by the UK Westminster Government, the Scottish Parliament and the City Council to try to pull the economy out of the current double dip recession. Unfortunately, if we continue with the current deflationary policies, many more of our citizens will be suffering the consequences of lengthening periods of unemployment and the negative effect of this on their living standards.